Create background sound for your website, present your music creations, share your musical taste: all that is easy with the Music block. Simply send your MP3 files and add this music player to your website. You can also search for public files in the SoundCloud database. To do so, type your keywords in the search field. Available for all the websites created with Premium package. 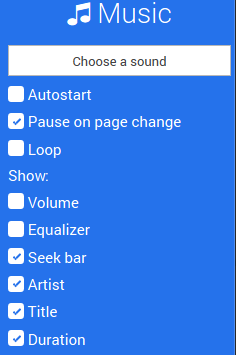 Changing page without stopping the music, for an ambient sound while visiting your website. Automatic playback when the page is loaded. the author and title of the MP3.